A decade long (and counting) period in the U.S. economic development when growth has been consistent with continued leveraging, not sustained by underlying income growth. The first point falls squarely within the secular stagnation thesis on the supply side: as the U.S. economy becomes more monopolistic, the engines for technological innovation switch to differentiation through less significant, but more frequent incremental innovation. This means that more technology is not enabling more investment, reducing the forces of creative destruction and lowering entrepreneurship and labor productivity growth. The second point supports secular stagnation on the demand side: as households' leverage is rising (slower growth in income, faster growth of debt loads), the growth capacity of the economy is becoming exhausted. Longer term growth rates contract and future income growth flattens out as well. The end game here is destabilization of the social order: leverage risk carries the risk of significant underfunding of the future pensions, it also reduces households' capacity to acquire homes that can be used for cheaper housing during pensionable years. Leveraging of parents leads to reduced capacity to fund education for children, lowering quantity and quality of education that can be attained by the future generation. Alternatively, for those who can attain credit for schooling, this shifts more debt into the earlier years of the household formation for the younger adults, depressing the rates of their future investment and savings. 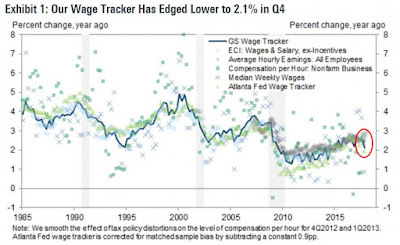 Goldman's research attempts to put a number on the costs of these dynamics, saying that in the longer run, rising concentration in the American private sector economy implies a 0.25% annual drop in wages growth since 2001. While the number appears to be small, it is significant. From economic perspective this implies 3.95% lower cumulative life cycle earnings for a person starting their career. And that is without accounting for the effects of the Great Recession. A person with a life cycle average earnings of USD50,000 would earn USD940,000 less over a 30-year long career under GS estimated impact scenario, than a person working in the economy with lower degree of corporate concentration. The 0.25% effect GS estimate is ambiguous. 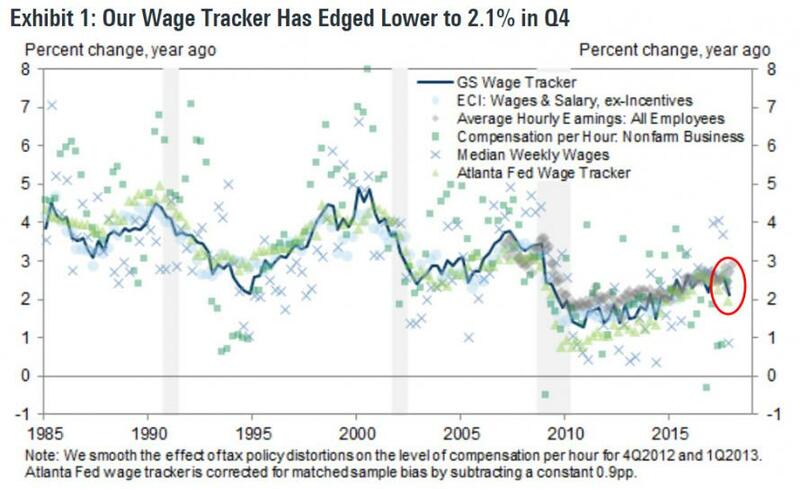 So take a different view: prior to the Global Financial Crisis, longer term wages growth was averaging above 3% pa. Today, in the 'Best Recovery, Ever' we have an average of around 2.2-2.4%. The gap is greater than 0.6-0.8 percentage points and is persistent. So take it at 0.6% over the longer term, forward, the lower envelope of the gap. Under that scenario, life cycle earnings of the same individual with USD 50,000 average life cycle income will be lower, cumulatively, by USD 1.53 million (or -6.4%). That is a lot of cash that is not going to be earned by people who need to buy homes, healthcare, education, raise kids and save for pensions. Remember the "Don't be evil" motto of one of these concentration behemoths that we celebrate as the champion of the American Dream? Well, their growing market power is doing no good for that very same Dream. Meanwhile, on academic side of things, the supply side secular stagnation thesis must be, from here on, augmented by yet another cause for a long term structural slowdown: the rising market concentration in the hands of the American Corporatocracy.